Happy Father's Day to all the Dads!!! I hope you are all being spoilt this morning. My hubby missed out on breakfast in bed this morning as we have to be up early and all pitch in to be ready for swimming at 8am. BUT I did make him a yummy breakfast. Apologies for the terrible photo, it was very dark and very early! These were some of the lightest and fluffiest pancakes I've made, which you can't always say about pancakes made without wheat flour and buttermilk (I've made some real duds over the years believe me!). Hubby and the kids LOVED them and they were the perfect start to Father's Day. Place a large pan over medium heat. In a large bowl place the flour, baking powder, coconut sugar and salt and whisk together. In a jug or small bowl, mix the eggs, vanilla, coconut milk and 1/2 cup of the milk together. Pour the wet ingredients into the dry ingredients and mix until only just combined. The batter should be thick but if it is too thick and sticky add more milk, a little at a time until it is smooth and spoonable. Drop some coconut oil into the pan and swirl to coat. Place spoonfuls of the mixture into the pan (I can fit 4 pancakes in my 10 inch pan). Cook until bubbles appear on the surface then turn and cook for another 2 minutes or so until golden brown and cooked through. 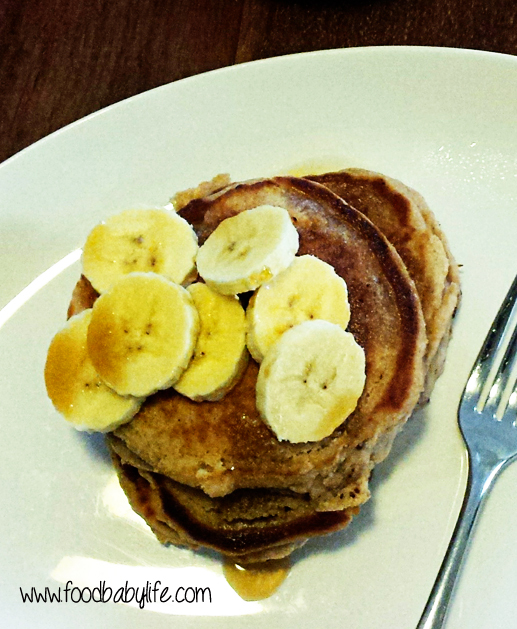 Place directly onto serving plates and top with sliced banana and a generous drizzle of maple syrup.